Summer is jam packed with events but one you won’t want to miss is the Falls Fireworks Illuminations. All throughout the summer you can catch a glimpse of the Falls in an unforgettable way — lit up by beautiful fireworks. The Niagara Parkway is the main thoroughfare through Niagara Falls — for motorists and pedestrians alike. The road follows the Niagara River through Ontario, providing amazing all-angle views of Niagara Falls and plenty of other attractions, including Clifton Hill and a few dozen Niagara wineries. The Parkway is the oldest path in Ontario, even dating back before Europeans began settling in the area. Today, you can walk the Parkway during the day to enjoy the stunning landscaping and fascinating scenery — or, even better, you can take a nighttime stroll and enjoy the fireworks over Niagara Falls. 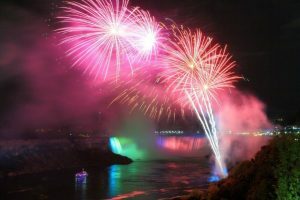 Ideally one of your first stops in Canada, the Table Rock Welcome Centre is perhaps the best place to see Niagara Falls — as well as the fireworks in Niagara Falls. One of several welcome centres around the Niagara Parks, Table Rock sees the most visitors thanks to its stunning location. During special event days, the centre boasts live music in addition to the concert, so you can enjoy exciting accompaniment to the flashes and bangs. No matter when you visit, you can sit on the grass, enjoy some ice cream, and watch the fireworks explode high above the falls right in front of you. When the sun is up, you can’t miss taking a boat ride to the base of the falls and feeling the thundering waters all around you. However, when night comes, most of the Niagara cruises close — except Hornblower. This brand-new experience gives you the chance to see the Niagara Falls firework high above as you cruise in the water below. A beloved and best place to view Niagara Falls is swiftly becoming the best place to watch illuminations thanks to this new tour option from Hornblower Cruises. You don’t have to be outside to see the fireworks over Niagara Falls; if you book a table at the renowned Niagara Falls restaurant, Windows by Jamie Kennedy, you can enjoy fine wining and dining while watching the show. Appropriately named for its floor-to-ceiling glass that provides an amazing panorama of the falls, Windows is also celebrated for its hand-crafted meals and cocktails. Chef Jaime Kennedy draws inspiration from the fertile lands of the Niagara region, which produce much of the food and drink you’ll see on your table. It’s easy to fall in love with Niagara when you can use all five senses to experience its beauty. Located on Clifton Hill, the Niagara SkyWheel is easily Canada’s largest observation wheel, taking riders up more than 175 feet over the Niagara horizon. Unlike other Ferris wheels, the SkyWheel provides a completely enclosed, temperature-controlled environment. During the day, you can catch birds-eye views of Horseshoe, Bridal Veil, and American Falls as well as see the snaking Niagara River far into the distance. At night, you can relax in comfort as the fireworks explode over Niagara. In itself a Niagara landmark, the Rainbow Bridge connects the New York side of Niagara Falls with the Ontario side. Slightly downriver from the falls, the bridge is the best place to see Niagara Falls in panorama: You can take snapshots that include all three waterfalls, Goat Island, and the Niagara Falls, Ontario skyline if you angle your camera just right. 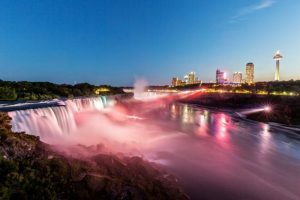 From this spot, you are far enough away to avoid the shuddering bangs of the fireworks, and you can take amazing pictures of the whole of Niagara illuminated in vibrant color. For most folks, Niagara Falls is on the bucket list for how it looks during the day. However, that doesn’t mean you should tuck into bed as soon as the sun sets. The dazzling Falls Fireworks Illuminations are just one reason you should explore Niagara after dark. With fewer people pacing the Niagara streets, you can enjoy a more intimate view of the city and enjoy a special look at the falls reflecting colorful lights. To see this magic firsthand, book a trip to Niagara Falls today.